Amtrak’;s summer repairs at Penn Station are officially complete. 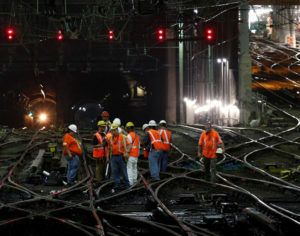 Here, track workers complete repairs to one of the main tracks, as a train emerges from the Hudson River tunnel. 5)New Orleans: From July 10th to September 1st, Amtrak’s Crescent (New York-New Orleans) was temporarily operating between Washington, DC and New Orleans. With the Crescent returning to its normal schedule on September 2nd, it’s time for Amtrak travelers to celebrate Mardi Gras year-round all over again. Passengers can feel the Cajun beat from New York to New Orleans without disruption. Football fans can catch the Saints at the Superdome. In New Orleans, it’s party time all the time. The craw fish, alligator meat, and the great deep south flavors await. Passengers can grab their ticket and beads! On the Crescent, the Cajun beat is non-stop. Of all Fall destinations, New Orleans is truly a city to “Fall” for. P-40 locomotive #701 leads an Empire Service train home from Niagara Falls. 4) Niagara Falls: Of all Amtrak Fall destinations, Niagara Falls is among the most family-oriented and above all, the most romantic. Amtrak travelers can escape the hustle and bustle of the New York metropolitan area for one of the most picturesque places on earth. From the “Maid of The Mist”, to strolling across the Rainbow Bridge, to experiencing the Niagara Falls Canada Whirlpool Aero Car, Amtrak presents Fall travelers with a ticket for the journey of a lifetime. The journey from New York City to Niagara Falls is a journey not to be missed. From departing cavernous Penn Station, to gliding along the city’s west side, to cruising beneath Riverside Park through the Overbuild Tunnel, and speeding along the mighty Hudson River, who would not want to pass up a train ride, a train ride to write home about? Niagara Falls is without-a-doubt, a must-do for all Amtrak Fall travelers. Travelers should forget about their barrels and let Amtrak take them to the edge of the excitement and experience the power of the falls. Twilight Shoreliner train #67 arrives at historic Williamsburg Station. 3) Williamsburg, VA: Do you hear the hoofs of Clydesdales? During the Fall. there is no better place to visit than the great state of Virginia. Williamsburg is one of the most romantic and the most charming towns in Virginia. Is is one of the great Fall destinations which speaks to the hearts of all train travelers. Williamsburg is the home of Colonial Williamsburg and Busch Gardens-Europe. Busch Gardens-Europe is home to the iconic Budweiser Clydesdales. There, visitors can see them up close. At Colonial Williamsburg, visitors can experience colonial life in the most authentic of surroundings. It is where history comes alive. At both of these quintessential points of interest, the Fall atmosphere can’t be more intimate. In Williamsburg, there are tons of hotels within minutes of the Amtrak’s Williamsburg station. Who said Virginia was for lovers? Virginia is for Amtrak travelers, too. 2) Boston: Boston, the City of Kind Hearts, is the one destination that was never affected by the summer cancellations. Of all Fall destinations, Boston speaks to the “heaht” of every Amtrak traveler. That says a lot for city known as Beantown. Visitors should be wary of the Boston accent. It is so thick, one can cut it with a “fawk”. Completed in 1898, Boston’s South Station is the oldest terminal on Amtrak’s Northeast Corridor. When Fall arrives, Boston’s sports atmosphere is in full swing. The New England Patriots will be defending their historic Super Bowl championship. The Red Sox will be going for their sixth World Series title. With so such energy in the air, Boston is the perfect Fall destination. 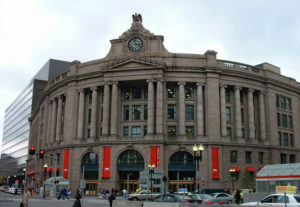 Passengers will step off their train at historic South Station. From there, they can visit the Seaport District, enjoy a bowl of fresh clam chowder, and mingle with the friendly city locals. Music lovers can head to Symphony Hall to tune in to the sounds of the Boston Symphony Orchestra and Boston Pops. Rock music fans can pay a visit to 1325 Commonwealth Avenue, the former residence of Aerosmith. Once the World Series is over, the seasons will change again. It will be game-on for Boston’s two other beloved teams, the Bruins and the Celtics. The Celtics will be in pursuit of their eighteenth NBA championship. The Boston Bruins will be pursuing their seventh Stanley Cup in franchise history. In Boston, Amtrak travelers aren’t just part of history. They are part of the revolution. 1) Washington, DC: Our nation’s capital was significantly affected by the summer cancellations. As of September 2nd, the trains will be running on a normal daily schedule. New York-Washington service will be fully restored. There is no better city to experience Fall colors than in Washington, DC. Washington, DC is the gem of all Fall destinations. Passengers will exit their train at the glorious Union Station. It’s not just a train station, it’s a feast for the eyes. 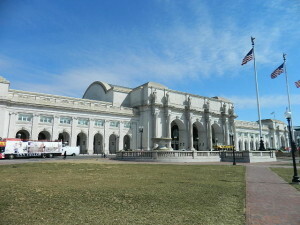 At Union Station, passengers can hop aboard the Metro subway to visit the National Mall and the Smithsonian museums. The Washington Monument, World War II Memorial, and Lincoln Memorial are just a short walking distance away. 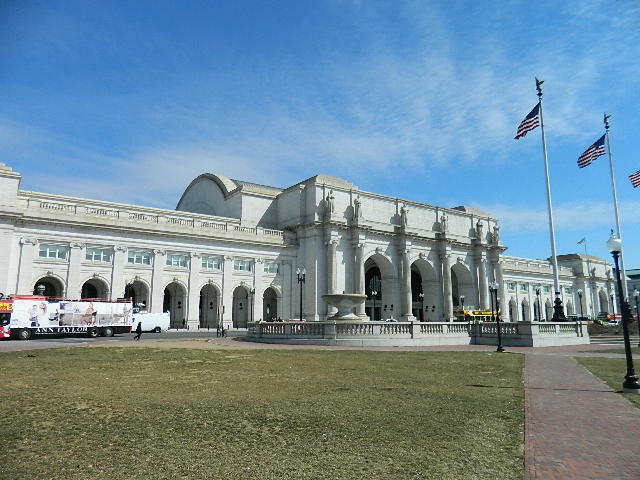 Built in 1907, Washington, DC’s Union Station was constructed to be both a railroad terminal and a monument in one. Speaking of Fall destinations, visitors can head to Six Flags America in nearby Largo, MD. Six Flags hosts its annual Fright Fest, blending the “spirit” of Halloween into its theme parks. Amtrak will have passengers “screaming” down the rails to be a part of an engaging Fall experience. Washington, DC is not just a city of museums and monuments. It’s a city for all seasons. Come Fall, it is game-on for the NFL’s Redskins, the NHL’s Capitals, and NBA’s Wizards. It’s easy to understand why Washington, DC is a destination of ‘monumental’ proportions. Fall is the right time to ride the rails. With the hot and humid summer coming to an end, the train schedule is returning to normal. It’s time to return to the pastime all travelers enjoy. Fall time is train time. Amtrak’s great Fall destinations are calling to avid train travelers. Fall time means train time. 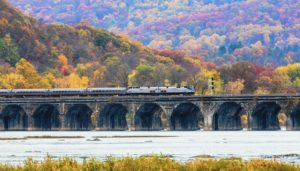 Here, a Amtrak’s Fall Foliage Express crosses the 115 year-old Rockville Bridge over the Susquehanna River near Marysville, PA.
Fall destinations are the reason why the train is the way to go. The Crescent will be returning to full service from New York to New Orleans. The Empire Route will be returning to a normal schedule out of Penn Station. 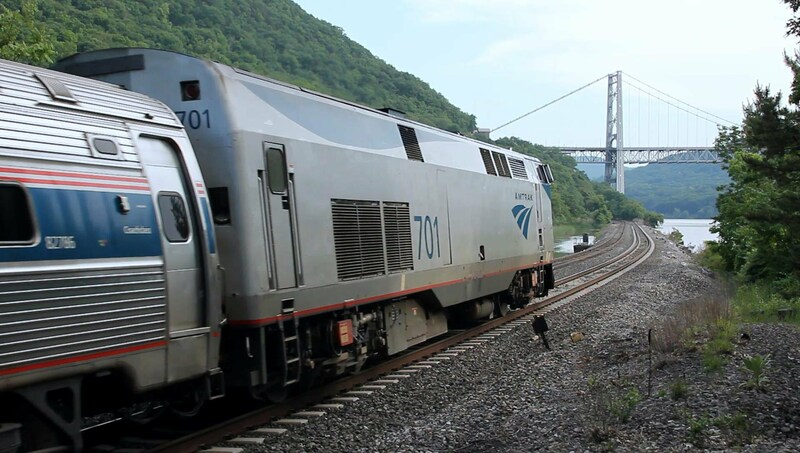 Last, but not least, Amtrak’s Northeast Regional trains will be once again thundering up and down the tracks between New York and Washington, DC. Fall foliage cannot be experienced better than through the windows of a train. 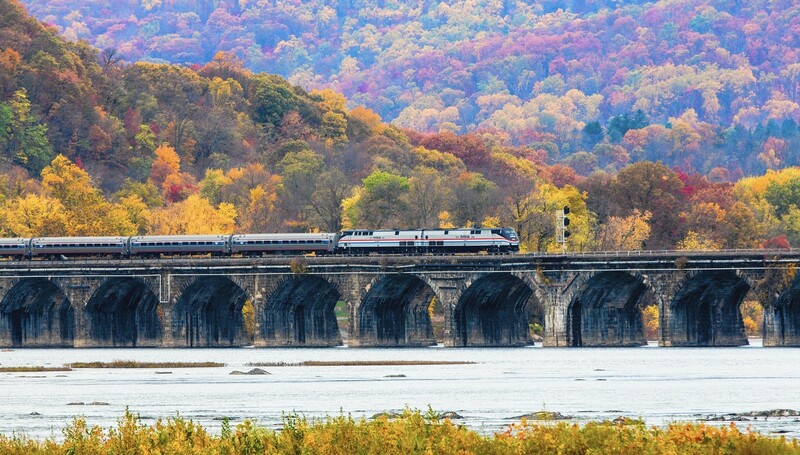 On any of Amtrak’s east coast routes, Fall scenery is always a feast for the eyes. In an old Amtrak commercial one can remember the jingle, “There’s something about a train that’s magic.”. That’s Fall!